Get ready to listen to the busy atmosphere of the racecourse with spectators all around you as you saddle up and attempt to guide your horse to victory to be crowned Champion of the Track and get your hands on the top prize of 97,000 coins! 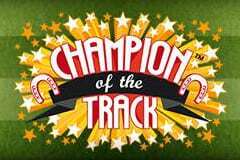 The Champion of the Track slot machine consists of 5x3 reels and 30 paylines that can be adjusted which are situated within the racetrack and enable you to saddle up from 30p up to £60 per spin. It’s designed in the style of a board game requiring you to make Career Steps with golden cups to win mystery prizes along the way, a free spins mode, plus you’ll enjoy a Day at the Races for the ultimate prizes, with the main aim being to be crowned champion jockey. It will take a total of 20 Career Steps to be crowned Champion of the Track but your progress gets saved at certain points on the track with that position saved for 48 hours and seeing you take up from the position you left off at which is extremely helpful! The face of a jockey who represents you is the highest valued symbol on the track with five on a payline resulting in a 10,000-coin win, plus it is the Wild symbol meaning it substitutes for all symbols except the Scatter (the horse) and Bonus (gold cup). In addition to this you’ll see a blue rosette with the number two on it for being runner-up when you agonisingly miss out on victory by a nose length, a pair of horseshoes, a stopwatch to time the race, binoculars for a great view of the action all around the track, plus there are four jockeys dressed in different colours with unique numbers. Whenever you land three or more Scatter symbols on the reels you will trigger a free spins bonus game. You will be rewarded with ten free spins to start with which have a 2x multiplier bonus attached to them, plus you will notice that your horse is pictured below the reels on the training track along with five horseshoe icons. As your free spins play out, each and every Scatter symbol that lands on the reels sees you tick off one of the horseshoe icons and sees your horse speed past one of the other horses to show off its’ championship racing capabilities. Should you pass all five horses in a session you’ll advance one career step on the track, plus it sees free spins reset to 10 and the Scatter counter reset back to 0, with any unused spins converted into a cash prize – with these prizes being worth double in your fourth session as you get the horse in tip top shape for the race. Life as a jockey is all about winning and you’ll have the opportunity to be crowned champion and collect gold cups thanks to the Day at the Races bonus feature which is triggered by landing three of the Bonus symbols (gold cup) on the reels at once. This sees you choose one of the four jockeys to represent you (either number 4, 5, 7 or 9) with each of them wearing different colours so that you can easily distinguish between them as they line up for a race. Once the starter lets them go they frantically speed away neck and neck in pulsating action and you’ll be cheering on hoping that your jockey can get the horse over the finish line first for the biggest prizes and to advance your career even further. Fourth place is out of the place positions and means that all that effort was for nothing as you win zilch, third place sees you scoop the bronze cup while moving two career places and enjoying a multiplier of 2x, second place sees you clutch hold of the silver cup for three career place moves and a 3x multiplier, while first place will see you proudly raise the gold cup above your head as you move four career places and enjoy a 5x multiplier. Get ready to saddle up and get your hands on the gold cup as the slot odds always seem to be in your favour in this pulsating horse racing themed slot machine from Net Entertainment!